After a fruitless effort back in December, when Kimberly and both our moms tried to brunch at the Sarabeth's' city location, we decided to try a more tranquil outpost on Long Island. We looked forward to it so much, but after a less than stellar experience, I highly doubt we'll ever go back. And even the city location will have to wait a bit until our nerves settle. Sarabeth's location alone should've been a warning sign, but I simply refused to take it into consideration (I wanted to try it that much). Located on the top floor of a Lord & Taylor in Manhasset (not far from the Americana luxury shopping center), Sarabeth's offers a large open space with plenty of seating. You don't ever have to worry about feeling crowded, as the immense room is well spaced out and decorated ever so sparingly with a muted color scheme and oversized lamp pendants. Overall, it's definitely nice but doesn't compare to the atmosphere that I imagine exists in the city locations. We've heard nothing but great things about Sarabeth's' homestyle food - its bread and tomato soup are signatures that we couldn't wait to try. However, what arrived on our plates was anything but appetizing and downright unacceptable. 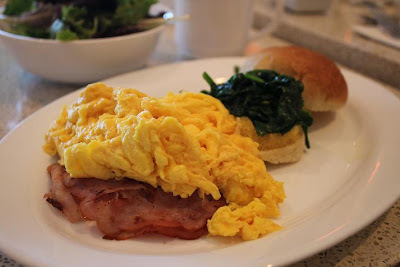 Popeye Eggs - I love to get eggs for brunch and this comforting combination just spoke to me. Consisting of scrambled eggs, sauteed spinach, black forest ham on a Sarabeth's English muffin, the latter ingredient was the only positive. I loved how soft, fluffy and moist the bread was - it was too bad that the eggs were downright rubbery and the spinach a watery mess. I also want to mention that nothing was seasoned, and I had to add a generous amount of salt and pepper to the whole dish to give it any sort of flavor. It made me feel cheated. 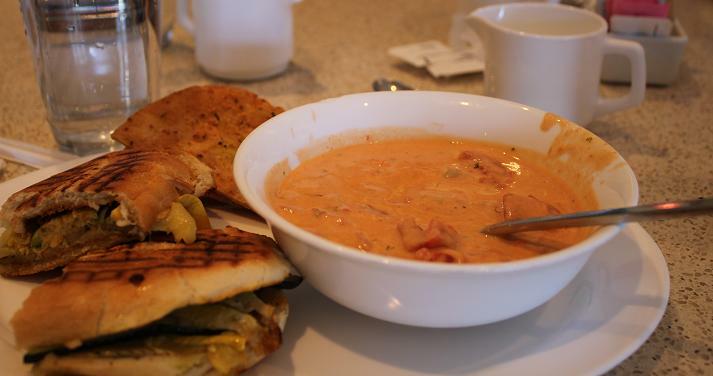 Paninis and Soup - Kimberly and Michelle both went for the grilled paninis and Sarabeth's famous Velvety Cream of Tomato Soup. Just like me, they were way disappointed with both items. I tried the soup and thought it was too heavy and far from velvety - actually, it seemed chunky and was sloppily ladled into the bowl. You can see the splash marks above, and that picture was taken before Kimberly dug in. Michelle's Grilled Mozzarella sandwich wasn't to her liking at all, and what she thought was mozzarella, actually tasted like American cheese. We asked our waiter to verify that it was indeed mozzarella, and he assured us by giving us a slice to taste. While the gesture would appear to be commendable, the attitude with which it was done was anything but. This is another area where our experience went completely wrong. From the start, our waiter was curt and condescending, first alienating me by not bringing me a glass of water, after he set one down in front of my dining companions. At first we gave him the benefit of the doubt, hoping he'd return with my glass, but no such luck. After I asked him to please get me a glass of water, he replied, "ok sure." Not "so sorry that I overlooked it." Costs are definitely expensive for the low quality of food and the sub par service. After we told the hostess what a terrible exprience we had, they took 10% off the check, which was a nice gesture. But even so...the whole thing was beyond repair. Couldn't agree more--what a poor representation of the Sarabeth brand. Could have made our brunch better at home, for half the cost. Those eggs look likely to have come from a box of egg mix. Blech! I really think this location hinders the Sarabeth's brand overall - totally agree with you Kimberly. Jen - the eggs could've been made by a non-cook. Probably would've done a better job. It was unacceptable. That's consistent with the experience I had at the Central Park South location. Service was less than abysmal, the food was completely flavorless and under-seasoned. I wrote to complain and they offered me a free meal. Sadly my experience was so bad that I wouldn't dream of taking them up on that offer. Best avoided. Wow...that is baaad Ann. Thanks for sharing.